Rolling Stones guitarist Ronnie Wood has teamed with Liberty of London to create the Ronnie Wood for Liberty of London capsule collection. The collection will be based on artwork by Wood and will include men's and women's clothing, as well as bags and accessories. Ronnie Wood has been painting since he was a child. He says in the bio at his website, "Art and music were my passions from an early age and my teachers encouraged me to take them further." His artwork was first shown on a TV art show called BBC's Sketch Club when he was ten. He went on to study art at Ealing Art College. Throughout his musical career, Ronnie Wood has continued to pursue his art. He started showing his art publicly in the 1980s. In the 1990s, he began putting his artwork into galleries in cities where the Stones were appearing and has since had many exhibitions around the world. Tamara Salman, Creative Director of Liberty of London says, "When I first went round to see his art I was so taken aback with his use of colour and marks! Ronnie has no fear in expressing himself and I love that. It was really difficult to decide which direction to go in as there were so many ways we could have interpreted the work. I fell in love with the pieces we used and Ronnie worked closely with me to contextualise them within a textile design." 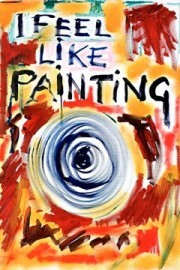 One of Ronnie Wood's paintings used for the collection is "I Feel Like Painting" (shown above). About the piece, Salman says, "‘I feel like painting’ is so strong, bold and instinctive. It was also the best painting that would work across all the different categories the collection required." The collection launches online on September 15, 2009. For more information about Ronnie Wood and his artwork, visit http://www.ronniewood.com/.